The Ennanga, a traditional arched harp played by the Ganda people. Discovering accurate transcriptions of the Ganda standard tune, Gganga Alula, in the works of ethnomusicologist Peter Cooke spoke directly about the life of a song. If the true essence of our traditional culture is preserved, then we’re going to find better solutions to our problems, perhaps utilizing this very poetic wisdom. Serubiri Moses attempts to shed more light on preservation of the essential African arts. everyone knew what this sound sounded like. While watching Albert Sempeke at the Sheraton play the buzzing bow-harp accompanying his rendition of the traditional Ganda standard tune, Gganga Alula, I had a truly unique experience hearing the sounds of what I can only refer to as ancient poetic wisdom, for what seemed like the very first time. This was something that had the capacity to transport you to a time myriad centuries ago. What it did was, it made me write poetry. What really impacted Tolkien was the unnervingly truthful sound held within the words of a 13th century poet. This could have been a 13th century poet from Buganda, for instance, whose poetic vision inspired such verses as are in Gganga Alula. A poet perhaps whose vision and wisdom, even relayed today through performance, could inspire such serene calm and collective awareness in children gathered around a fire. This is the togetherness that is sometimes referred to as O’luganda, the core philosophy of all Ganda culture. 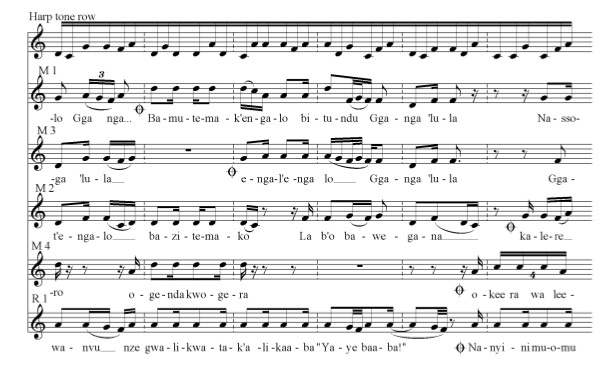 Notation from the traditional Kiganda song called “Gganga aluwa”. The mysteries within this song are so fresh and astounding. 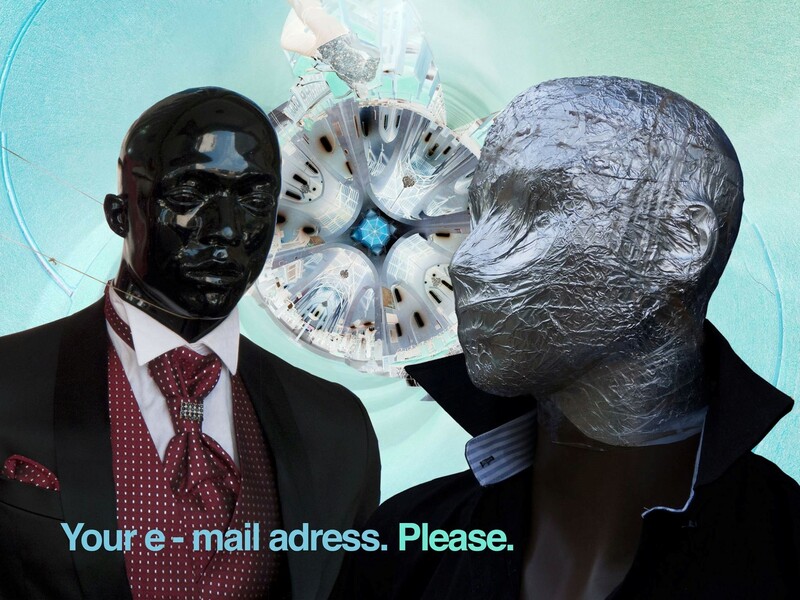 You are introduced quickly to the image of amputated fingers, with a reprimanding voice urging you to look at the cut-off fingers followed by the close image of the man, Gganga fleeing for his life. This all happens in a melody. It is quite hypnotizing. The story was, when a youthful page sexually harassed one of the princesses, he was punished but not executed for his crime. It is safe to say that there is much music within the Luganda language itself, which in turn is the basis of Kiganda music and questionably all music. The Kiganda music rises and falls with words (Kabuye). 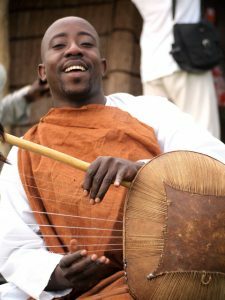 After a while it seems apparent that the songs even as played on instruments have a deeper philosophical meaning, signifying a strong poetic nature which in itself is the purest form of the language and wisdom of generations upon generations of Baganda. 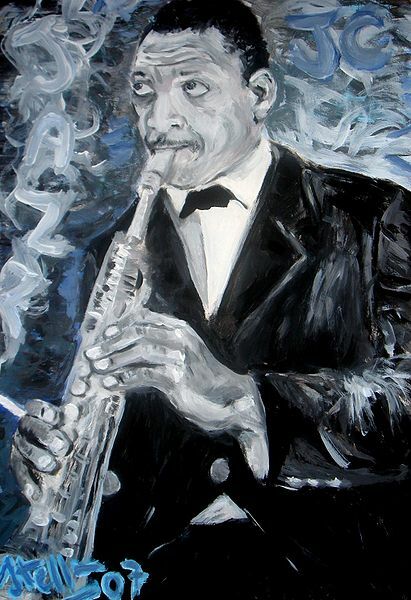 A portrait of John Coltrane by Paolo Steffan, 2007. (c) Paolo Steffan. The format itself is built more on a poetic form of writing, and source of this poetry is various religious texts. The particular song that comes to mind is the fourth movement called Psalm. An entire poem was printed on the album sleeve, which text is played on the saxophone, with refrains like “Thank You, God” being completely recognizable. This being, of course, is the absolute essence of African culture. It is what, for instance, I experienced while listening to Albert Sempeke perform Gganga Alula accompanying himself on bow harp. It brings to mind the survival of African culture and philosophy. As we strive to become better integrated in the global economy, also under the pressures of similar diplomatic ties, what can we do to retain this essence of African culture, and perhaps in effect expose it to the world at large? 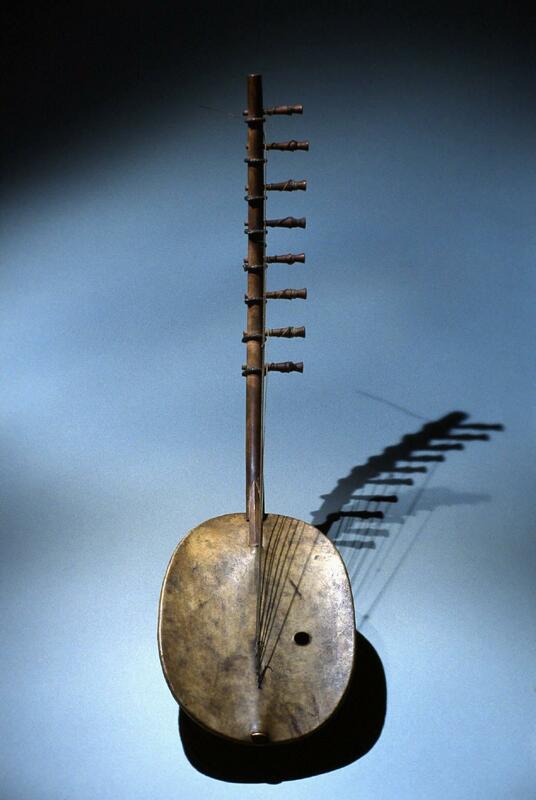 I beg to question the survival of our essential African art, music & philosophy. How has our Ugandan music been preserved? Even with the artistic interactions in today’s Ugandan society, we have tended to displace the role of art leaving a gaping hole forcing people to search for belonging elsewhere. Poverty and disease have also contributed a lot to this condition, and yet we continue to become more and more estranged to our more historical culture. But if the true essence of our traditional culture is preserved, then we’re going to find better solutions to our problems, perhaps utilizing the poetic wisdom passed on along a myriad of centuries right to today through art, music and philosophy. 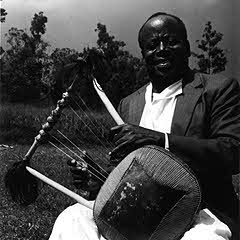 Albert Sempeke’s father the late Dr. Sempeke played with the master court musicians such as Temutewo Mukasa. Had Dr. Sempeke not survived the bomb blasts at the Lubiri in the early 1960s, perhaps there would not have been such an original performance in 2011 by his son. Lore has it that being the captivating performer he was, it wasn’t a wedding without Dr. Sempeke’s performance. 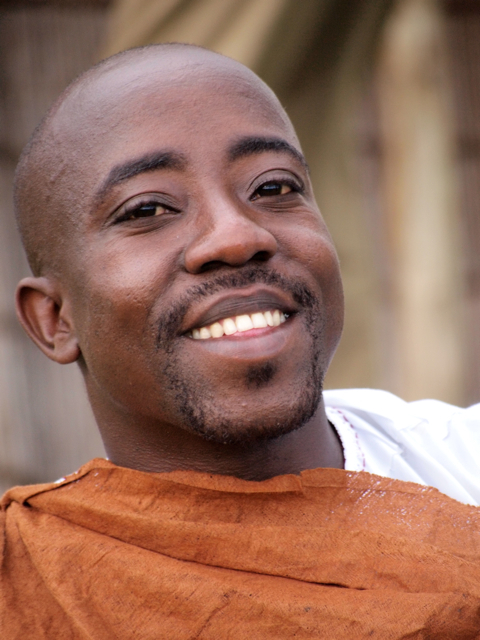 Dr. Sempeke drew ethnomusicologists interested in traditional African music to study with him. He was then invited to give lectures at different universities, where Dr. Sempeke would lecture and perform for students. The students of the University of Florida in particular were so moved by the musician that they demanded he be given an honorary doctorate for his work. An important aspect of Dr. Sempeke’s legacy is through the music of modern classical composer Gyorgi Ligeti who passed away in 2006. He was strongly influenced by the poly-rhythms and counter melodies he encountered in Sempeke’s music, inspiring a large number of his works. The fact that Ganda music inspired the compositions of a a cornerstone modern classical music innovator in Europe, is worth noting. Albert Sempeke was invited to perform at Gyorgi Ligeti’s birthday celebration in 2005, with the intention to show everyone where his inspiration came from, broadening the life and presence of these Ganda songs. Serubiri Moses is a published writer who enjoys philosophical debates on jazz, classical music and the history of African art. He is currently a freelance writer who in addition, plays 2nd Violin in the Kampala Symphony Orchestra.